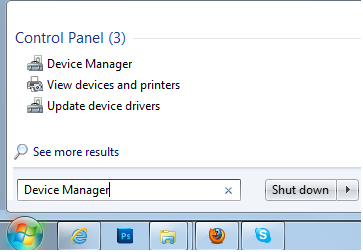 Press the Windows key on your keyboard + X, then select Device Manager. 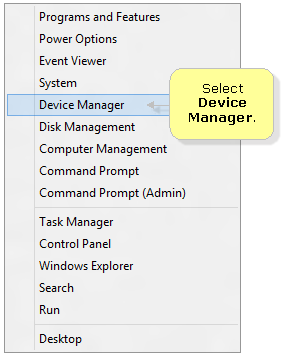 QUICK TIP: For Windows 8.1, you can right-click on the Start button and select Device Manager. 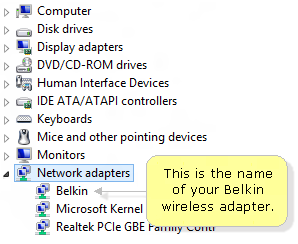 On the Device Manager window, click Network adapters then look for the name of your Belkin wireless adapter. IMPORTANT: Take note of the icon beside the name of your wireless adapter to verify its status. – This icon means that the adapter is enabled and is working properly. – This means that the adapter is disabled. 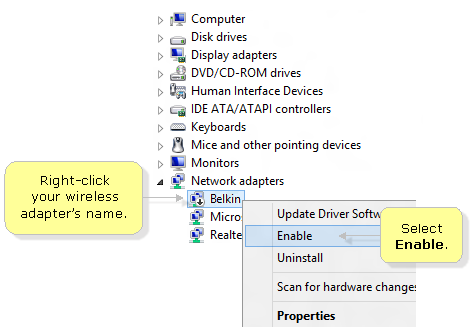 To enable it, right-click the name of your Belkin wireless adapter then select Enable. Once the adapter is enabled, right-click your computer’s network adapter then select Properties. There would be a This device is working properly. notification if the adapter is working properly. 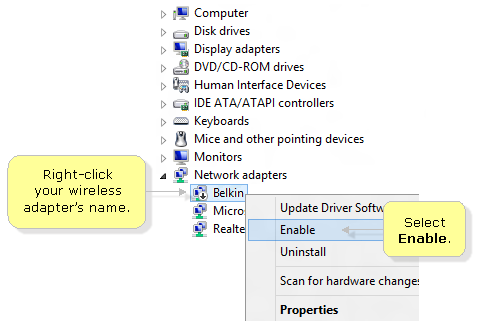 Remove the Belkin wireless adapter for a few seconds then re-insert the device. Recheck the status of the adapter in the Device Manager afterwards. If the adapter is attached to a cradle base, remove it and plug the adapter directly to the USB port of the computer. Update or install the driver of your adapter. To learn how to update or install your adapter, click here. NOTE: If the issue persists, isolate the problem by installing the adapter using another computer. Click the Pearl button located at the bottom left corner of the screen. In the Search programs and files field, enter “Device Manager” then press [Enter] then select Device Manager from the search results. 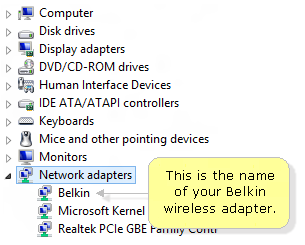 Remove the Belkin wireless adapter for a few seconds then re-insert the device. Re-check the status of the adapter in the Device Manager afterwards. Right-click on My Computer then click Properties. 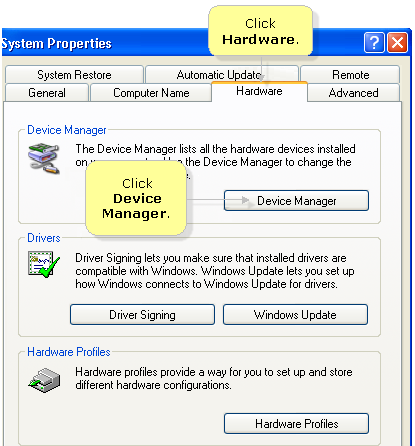 Click Hardware then Device Manager. 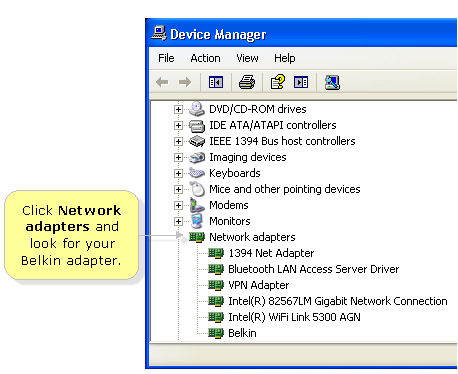 On the Device Manager window, click Network adapters then look for your Belkin wireless adapter. – This means that the adapter has been disabled. 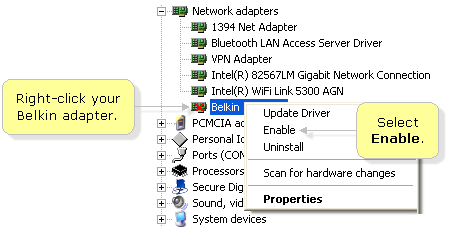 To enable it, right-click the Belkin adapter icon and click Enable. 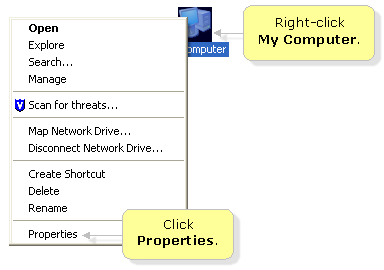 Once the adapter is enabled, right-click your computer’s network adapter then select Properties. There would be a This device is working properly. notification if the adapter is working properly. ​​NOTE: If the issue persists, isolate the problem by installing the adapter using another computer.